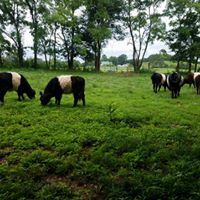 Our Belted Galloways are raised on organic pasture & grass finished. We began offering half or whole animals in 2017. Belties produce lean high quality marbled beef. Beef from Belted Galloways is low in saturated fat and well-marbled, making for excellent meat quality. Marbling, the presence of intramuscular fat throughout the meat, is believed to greatly enhance flavor and tenderness. Their conversion of grass to muscle is also considered excellent,They are able to maintain good condition on less than ideal pasture, and produce a high quality beef product on grass alone. The Belted Galloway breed originated in the rugged hill country of southern Scotland, the breed is over 1000 years old. Many farmers find them very easy to handle, which is a bonus for small farms with only one worker. 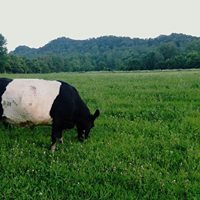 They have helped us convert overgrown fields to pasture.